Richard Arkwright and his partners established a mill in Cromford in 1771, the world's first water powered cotton spinning mill. In 1776 a second much larger mill was established using the same water supply and massive engineering work was undertaken to create the system of ponds and underground culverts which maintained Arkwright's increasing need for water to drive his machinery. Arkwright's mill is now a world heritage site with a visitors centre and other amenities. Guided tours are available upon request. Prize fighting was once a popular past time in Flash, and continued long after it had been made illegal. Fights often took place at Three Shire's Head, a local beauty spot, containing a graceful packhorse bridge and small waterfalls, situated about a mile north west of the village. 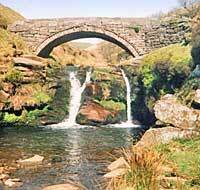 It is the meeting place of the 3 counties of Derbyshire, Cheshire and Staffordshire, hence its name. Flash was also noted as the centre for counterfeiting money, which became known as 'flash' from its place of origin.